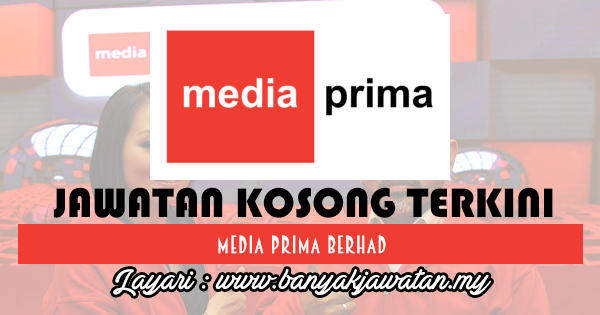 MEDIA PRIMA BERHAD is a fully integrated media Company in Malaysia that has equity interests on television stations, newspapers, radio stations and digital media. The Group has equity interests in TV3, 8TV, NTV7 and TV9. In addition, the Group also owns more than 98 per cent equity interest in The New Straits Times Press (M) Berhad (NSTP), Malaysia largest publisher with three national newspapers; New Straits Times, Berita Harian and Harian Metro. The Group also owns a content creation subsidiary, Primeworks Studios Sdn Bhd, Malaysia's largest production company, producing TV content and feature films since 1984 and 1994 respectively. 0 Response to "Jawatan Kosong di Media Prima Berhad - 6 May 2017"